Congratulations to Our 2018 Rookie of the Year Award Winner, Genevieve Bohnak! The Rookie of the Year Award is an honor bestowed to a new member in her first year of active membership who has been an inspiration and mentor to the rest of the Provisional class. 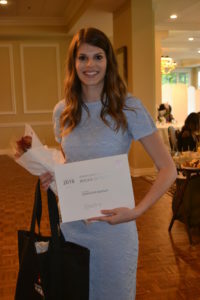 She is involved in other Junior League of Akron projects or fundraisers, has demonstrated the willingness to take on other projects or tasks, and is considered consistently dependable. The winner of the Rookie of the Year Award is Genevieve Bohnak of Cuyahoga Falls. Bohnak is the Community Development Coordinator at the Alzheimer’s Association: Greater East Ohio Chapter, and she joined the Junior League of Akron in 2016. In the League, Bohnak has been involved as a member of the Communications Council, where she was instrumental in social media responsibilities. Bohnak is currently serving as the Vice President of Fund Development. Outside of the League, Bohnak is involved with Kappa Kappa Gamma Sorority; she is the Public Relations Advisor for the Eta Zeta chapter at the University of Akron and the Communication Chairman for the Kappa Kappa Gamma Alumnae Association.